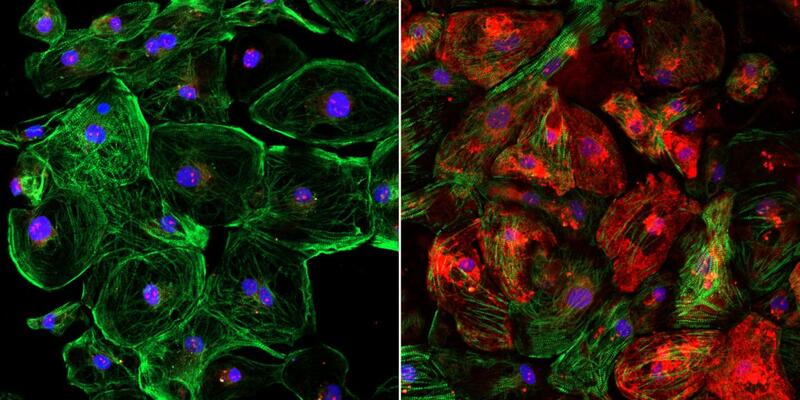 DALLAS – March 6, 2019 – Scientists have developed a method to boost the efficiency of CRISPR gene editing in Duchenne muscular dystrophy (DMD), according to a study that could have implications for optimizing gene therapies for other diseases. While testing the technique, scientists discovered that adjusting the dosages of CRISPR’s gene-editing components can significantly improve how much dystrophin is produced by the edited genes. They further found that the optimal ratio of components changed based on which part of the DNA was being edited. The gene-editing technique used by the researchers requires two components – an enzyme called Cas9 that cuts DNA and a guide RNA that functions like a molecular GPS device to direct Cas9 to the specific DNA sequence in the genome to be edited. Dr. Olson’s lab developed a method to edit the defective portion of the dystrophin gene by loading Cas9 into an adeno-associated virus (AAV), a harmless virus that is used to deliver the editing components into the cells. The guide RNA is also loaded into an AAV to direct Cas9 to the mutation where it snips the DNA. In the new study targeting a different part of the gene, they discovered the 1-to-1 ratio didn’t work as well: Dystrophin production was only restored to 5 percent of normal when delivered into the blood stream. The techniques have not yet been approved for clinical use, but Dr. Olson’s team took a major step toward that goal last year after publishing a Science study showing that CRISPR edits on exon 51 halted the progression of DMD in dogs. Dr. Olson hopes the next step beyond dogs is a clinical trial, which would be among several that UT Southwestern’s gene therapy program aims to launch in the coming years to address numerous deadly childhood diseases. Dr. Olson is Director of UT Southwestern’s Hamon Center for Regenerative Science and Medicine, and Professor and Chair of Molecular Biology. He holds the Pogue Distinguished Chair in Research on Cardiac Birth Defects, the Robert A. Welch Distinguished Chair in Science, and the Annie and Willie Nelson Professorship in Stem Cell Research. He is also the founder of Exonics Therapeutics Inc., launched in February 2017 to advance and commercialize his research. The study was supported, in part, by Exonics Therapeutics Inc. and grants from the National Institutes of Health, the Senator Paul D. Wellstone Muscular Dystrophy Cooperative Research Center, The Robert A. Welch Foundation, Parent Project Muscular Dystrophy, and CureDuchenne. Disclosure statements: Dr. Eric Olson is a scientific co-founder of, and consultant for, Exonics Therapeutics, and has license and investment interests with the company. Drs. Olson and Yi-Li Min are co-inventors on a patent application regarding the mouse model and strategy presented in this study. Dr. Min worked in Dr. Olson’s lab while the research was conducted and is now an employee of Exonics.